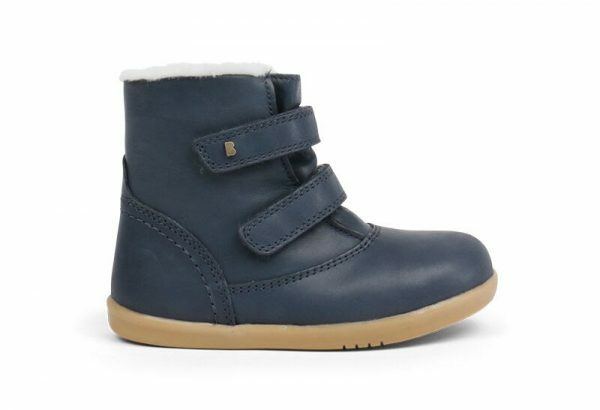 New this season is Bobux Aspen in classic navy with white fleece lining and two velcro straps for a secure winter boot. New this season at Treehouse Childrenswear is our Bobux Aspen navy. It is a mid calf boot with white fleece lining for extra warmth over the winter months. 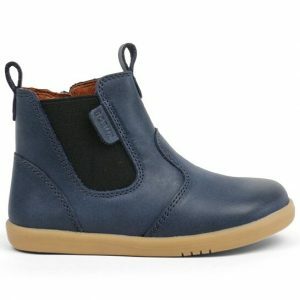 It has two Velcro straps for a secure fit for a winter boot and flexible caramel colour sole. Bobux shoes are generally a wider fit suitable for a G or H width and come with a nice round toe edge for a great fit. No detail, lovely classic style that can be suitable for girl or boy.